Green iguanas are a really iconic lizard, so I want to write about them today. They are a very big lizard, growing up to 2 metres long. They often live near water so that they can swim away from predators. Despite how scary they look, they only eat plants, including fruit, flowers and leaves and are very docile, so people often keep them as pets. Young green iguanas will often eat the poo of grown up iguanas to get the necessary bacteria required to digest their food. They are a very common species, and are found in Central and South America and many Caribbean islands. They have also been introduced to parts of the United States. 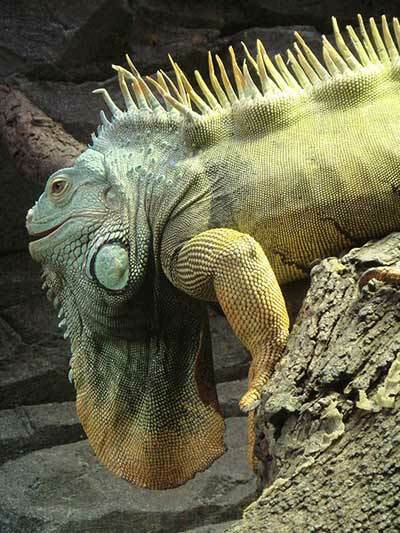 Are there any other interesting facts that you would like to share about green iguanas?